Be conscious of the decisions you make today as well as the words you use to communicate your needs. 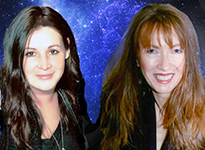 With Mercury conjuncting the North Node, what you put out there can have far reaching consequences, particularly in the way you express yourself to others. The North Node, like the Wheel of Fortune, refers to karma, fate and destiny. Reaping and sewing. The Law of Attraction. The winds of change. It’s a reminder that all we send out comes back to us in some form or another. It may not be today; it may be months or years or even lifetimes away. Venus and Chiron are also in aspect today, indicating a need to let go of painful associations. This can be an important step toward clearing up some of the negativity in your life, especially if you’re holding onto something (or someone) that no longer serves you. The Wheel of Fortune is all about life’s natural cycles and rhythms. It can bring exciting new opportunities or challenges you have to face. There are as many ups and downs as there are highs and lows. One day you’re “on top of the world” and the next you’re clawing your way back up from the bottom. Remember that as one one door closes, another one opens — just as the wheel turns and the seasons change. Today’s transits speak of finding ways to voice your intentions while at the same time putting disappointments and heartaches behind you. 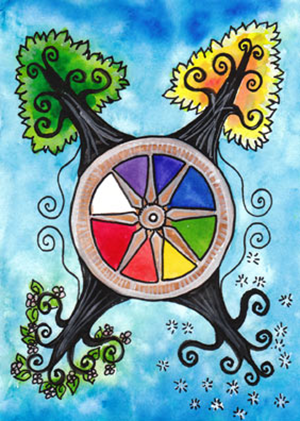 The card used for today’s tarotscope — Wheel of Fortune — is from the Tarot of the Trees designed by Dana Driscoll. Available for purchase through the Tarot of the Trees website. Please also visit and “like” this deck’s Facebook Fanpage. This deck is also now available for iPhone/iPad and Android devices.through the Fool’s Dog website. yes… its like a refreshing change… clears the mind and in turn clears our next steps forward.